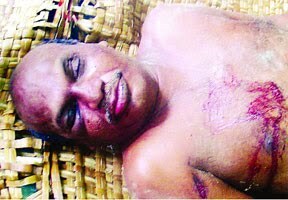 By Bangladesh Media, The Daily Independent reports, a regional leader of 'Sarbahara Kamrul Group' was killed in a 'shootout' between the outlawed group and Rapid Action Battalion (RAB) at Char Hogla Patia in Babuganj upazila on Saturday. The deceased was identified as Jagodish Sheel alias Jagasher Roy alias Joga, 52, son of late Nishi Kanta Roy at Brahmandia in Babuganj upazila. Police said, Jagadish Sheel was wanted in 12 criminal cases including murder and robbery. Acting on secret information, a patrol team of RAB-8 conducted a drive while Jagodish along with his accomplices was gathering in the area at about 10:35 pm. Sensing the presence of RAB, the terrorists opened fire on the elite force, prompting them to fire back that triggered a gun-battle, said a RAB press release. Later, on information, police and local people joined with RAB to strengthen the operation. At one stage Jagodish was felled by a bullet but his accomplices managed to flee the scene. RAB also recovered one foreign revolver loaded with three bullets, one LG loaded with three bullets, four rounds of bullet, two sharp weapons and a torch light from the spot.